All this is like a history lesson to me, as well as an update on what the OS movement has been about. Like I said, I started on blue box when I was about ten, and left it behind pretty fast. Number of Players: At least one referee and from four to fifty players can be handled in any single campaign but the referee to player ration should be about 1:20 or thereabouts. Initial white box play must have been radically different to what I know. I'm now imagining a large scale miniatures set up with lots of retainers and troops, with lead characters standing forward. The classic 'party of 4' must have been a later development. 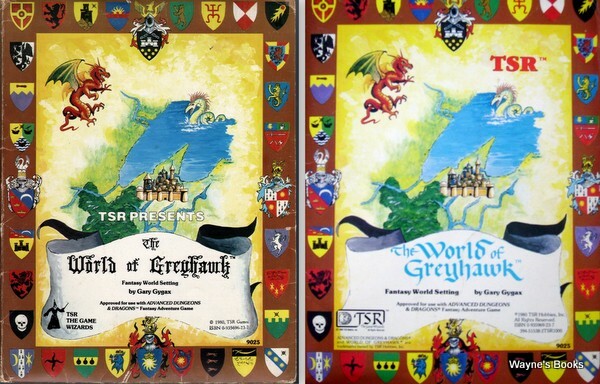 I have never see the Greyhawk supplement - I just got the campaign booklet and gazetteer. Longman wrote: Number of Players: At least one referee and from four to fifty players can be handled in any single campaign but the referee to player ration should be about 1:20 or thereabouts. I'm reading it over and I'm confused about one thing. How can a magic-user have a minimum # of spells? I can see them starting the game with a minimum # of spells but how does that work when they level up? Do they automatically gain the required number of spells to take them to the next minimum level? And it says per level so a 5th level magic-user with INT 14 would have a minimum of 25 spells? I must be missing something cause that just doesn't seem right. I had look at that Rythlondar document and got to the expedition table. You're right, it does look like about 7-10 round the table at any given time. Man, a lot of those guys died. Poor old 'L Scensny' died 4 times in 7 expeditions. Blazeguard wrote: I'm reading it over and I'm confused about one thing. How can a magic-user have a minimum # of spells? I can see them starting the game with a minimum # of spells but how does that work when they level up? Do they automatically gain the required number of spells to take them to the next minimum level? And it says per level so a 5th level magic-user with INT 14 would have a minimum of 25 spells? I must be missing something cause that just doesn't seem right. Its the minimum per spell level, not class level, so a 5th level MU with 14 INT would have a minimum of 5 spells of each level in his spell book. He will have a minimum of 5 level 1 spells, 5 level 2 spell and 5 level 3 spells. Once he reaches 7th level he will be able to learn a minimum of 5 level 4 spells. The minimum spells are those that don't require a learning roll, if the MU has learned less than his min number of 2nd level spells and he acquires a 2nd level spell that he wishes to learn he will do it automatically. That's my interpretation of those rules. Longman wrote: The classic 'party of 4' must have been a later development. Uh, yeah. Later, like about Y2K. Four players was always kind of the minimum, and hardly the preferred number. This was always a bit unclear, but basically, the player rolls for each spell the character might learn; if, after making all the rolls, the character doesn't know the minimum number of spells, re-rolling is allowed until the minimum is met. In practice, most people make the rolls only as spells become available. Making the roll doesn't mean the character knows the spell, but only that he or she is eligible to put it into his or her book. Likewise, the maximum number limits how many successful rolls the character can benefit from. Just downloaded and started looking it over. Interesting stuff. How do you see it being different from, say S&W Whitebox, Delving Deeper, or Spellcraft & Swordplay? Also, how big do you expect this book to be? If it's going to be a little thing, it might be neat to put it in a 6"x9" format. Sort of reminiscent of the "booklets" of the original game? The Hooded Man will come to the forest, there to meet with Herne the Hunter, to be his son and do his bidding. Hernes Son wrote: Just downloaded and started looking it over. Interesting stuff. How do you see it being different from, say S&W Whitebox, Delving Deeper, or Spellcraft & Swordplay? Gah. There's an OGL rule that prohibits me from comparing my own OGL-covered game with any other game (OGL or not), so I can't directly answer that question. But... I can't find any rule that prohibits me from comparing other people's games to each other. So, go up and re-read my D&D notes above first. Done? Okay. Delving Deeper present three-class original D&D with just the alternate combat system from Greyhawk. S&W Whitebox does that also, and then changes some things (like having just one saving throw category). Spellcraft & Swordplay is, as best as I can tell, a "true" clone of the original D&D game plus Chainmail, i.e. a clone of the very first print version of D&D. Hernes Son wrote: Also, how big do you expect this book to be? If it's going to be a little thing, it might be neat to put it in a 6"x9" format. Sort of reminiscent of the "booklets" of the original game? 8.5x11 most likely. The smaller format is "nice" but it runs the price up and is harder to lay out for this type of book... a single column is too wide, a double too small, for the monster section anyway. I'd have to redesign my monster statblock layout to work in that format, and I'm comfortable with it. Honestly, the higher cost is a sticking point for me anyway. Solo: if anything of what I'm going to post is not allowed please excuse me and erase it. Iron Falcon: wider range of ability modifiers; d4 to d8 hit dice, percentage and d6 rolls for thieve's skills, variable dice for damage (with the distinction of damage versus size), 22 levels. Delving Deeper: Minimal ability modifiers, d6 for hit dice, 1-3 in a d6 chance for thieve's skill success, d6 for damage, 12 levels, healing takes 2 days of no activity per HP regained. Spellcraft & Swordplay: Unified ability bonus. ability rolls for saving throws, d6 for hit dice, classes have "elite classes", 10 levels, classes gain more attacks in a faster way compared to their attack bonus, spell casting rolls, 2d6 rolls of thieves skills, optional unified skill rolls of 2d6, attacks are made on 2d6, attack matrix based on weapon vs AC, d6 for damage, healing per night of rest is Level + Con mod. Solo, whats the healing rate on IF? It seems that part is still under construction or entirely out of the game. This is neat. Definitely checking it out. the way it handles hit dice and very few stat bonuses. Trouble is all the material out there is written for B/X and 1e. I wonder if there are easy ways to convert B/X modules to OD&D. Solo, any thoughts on d6 damage instead of variable? I noticed a few of the weapons do d12 which seems pretty enormous for OD&D? EDIT: BTW, neat project, thanks for arranging and posting.